Dubai owes much of its current success to the discovery of oil offshore in the late 1960’s. A spike in oil prices during the 1970’s was the spark that ignited Dubai’s economic boom. Today, global oil consumption has risen steadily as more and more people gain access to new technologies. Developing countries are becoming industrialized and are demanding their share of the global oil reserves, while long time users are increasing their demands daily. Because of this the world’s oil reserves are being depleted at a fantastic rate. It is believed that peak oil production will occur in 2020. From this point on, oil production will steadily decline; and oil consumption must eventually do the same. Dubai is already turning the focus away from its oil history and toward its global future. Oil now accounts for only 6% of its total revenue. Dubai’s desire for a global presence has been the cause for an almost manic development. A desert oasis has grown out of nothing to host some of the world’s most astounding monuments and most advanced technological achievements. Designed as a tourist destination, Dubai has no problem drawing people in, but there is still a missing sense of legitimacy. The U.A.E. is becoming an arts and culture center through the use of boutique museums and cultural icons. This is Dubai’s opportunity to create a new arts center just outside the city. Following the model of the Venice Biennale, this project proposes a biennial exhibition be created in Dubai. However, this exhibition will not be a limited participation biennale that is overly focused on western culture, but an open art exhibition where global artists can be exhibited and discovered. Artists are beginning to test the different ways in which art can be defined and because of this, new forms of art are emerging. These exhibition spaces will be set up to display new forms of multimedia art and solar art rather than traditional forms. There is an overall rethinking of the relationship between art and energy taking place, and this is the moment when a Solar Biennale would be a welcome addition. This proposal implements a system of nodes derived from a mapping of the top 100 oil consuming countries in the world. This map will provide a basis for both the biennial pavilions at ground level, and the solar canopy that powers the spaces. The ground-level pavilions will compose the Solar Biennale, and will serve to house the multimedia presentations on the site. 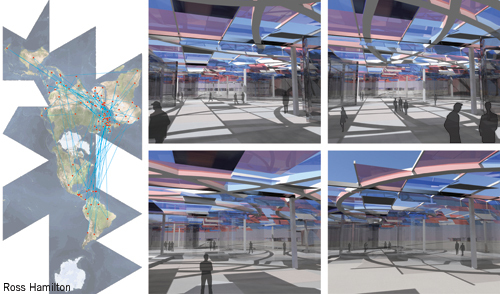 The overhead solar canopy will provide shade for the pavilions and event spaces while producing energy to be redistributed to the grid or used on-site. The pavilions and installations will be able to plug directly into the surface for power. 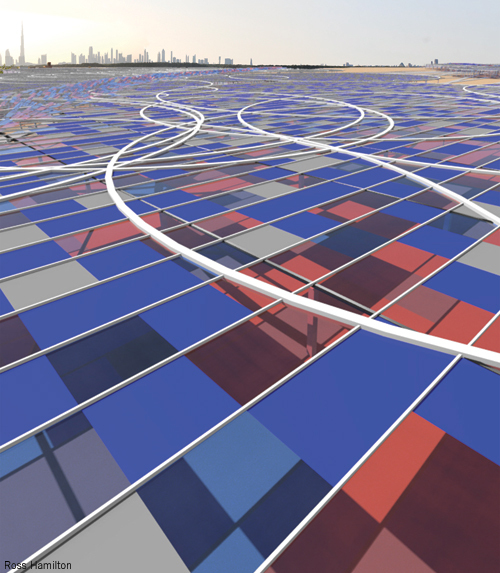 The surface will be composed of four different types of solar panels: a “traditional” blue solar panel, opaque and monolithic; red solar film, transparent and flexible; grey solar fabric, opaque and flexible; and light blue solar units, transparent and modular. Over time, as the oil use throughout the world changes, the map will have to be redrawn. As the world oil supply begins to dwindle; alternative fuels will become more common, and countries will begin to move away from the use of crude oil. The solar network that exists on the site will shrink gradually as oil consumption is reduced. This will invest the site with a sense of dynamism which will encourage people to come visit again and again as time passes, especially as oil use nears zero. When oil consumption finally dwindles to zero and the last solar panel is removed from the site, the world will celebrate its long awaited freedom from oil. With the removal of the last pavilion, media art is fully integrated into society, and the next land-art generator initiative is born.